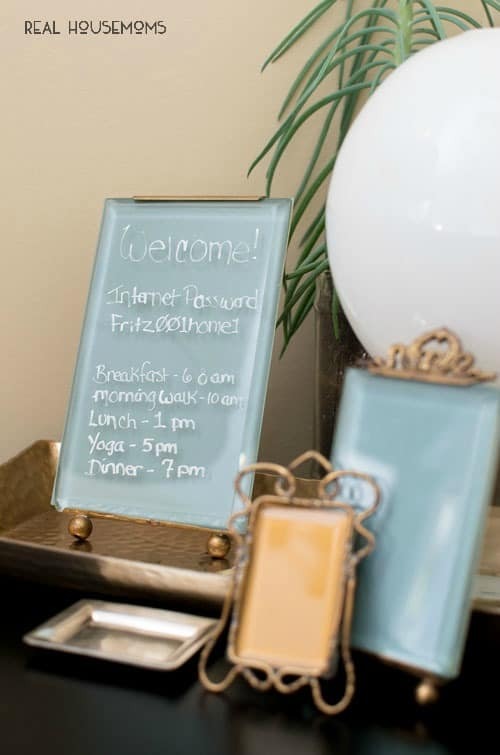 Make a decorative DIY Glass Memo Board to help your guests feel welcome and keep them informed! Hey Real Housemoms! Lately I’ve been busy redefining a few spaces in our home. 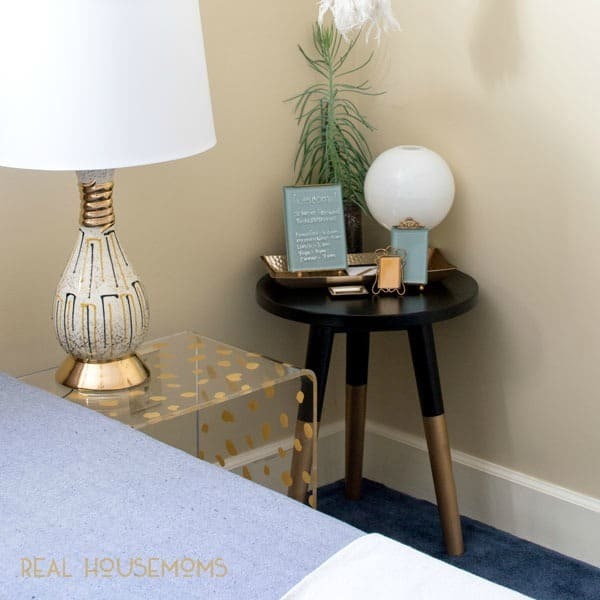 It all started when I gave our tiny bedroom new life by creating a functional guest room in a small space. Go check it out – the design is filled with a mix of vintage and modern, and it turned out beautifully. But even better than how gorgeous it is, this tiny room now functions for all my needs. Once I defined this room as a proper guest room, I knew I wanted to include a few details to make guests feel more comfortable. Little things like having a notepad nearby, access to the household wi-fi, and an extra blanket on hand are a few ways to ease guests into their new surroundings. Another thoughtful touch is to provide a general agenda of how your family rolls during the week so your company knows what to expect during their stay. For my guests, I made a decorative diy memo board to place beside the bed that has all the information they might need. For my newly designed guest room I chose to use a beautiful picture frame as my memo board. Backed with a lovely piece of mat board, it became a perfect solution that fit in perfectly with the room’s design. Using a chalk marker, I can jot down all the deets for my guests. And with just a wipe of glass cleaner on a paper towel, I can update the schedule as needed. This sweet collection of frames are French antiques from the 1920s. Even without a picture inside they’re an interesting study in detail. 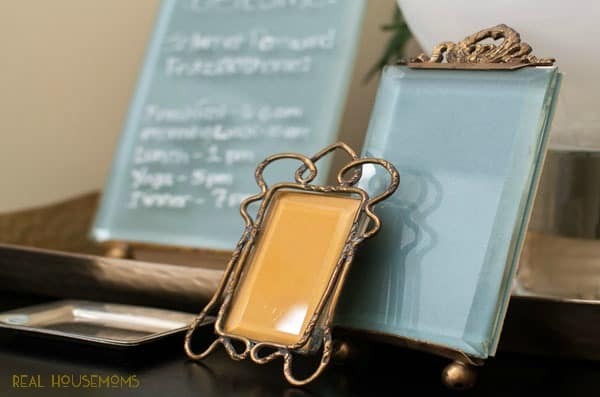 And it’s this detail that makes them the perfect choice as little memo boards. 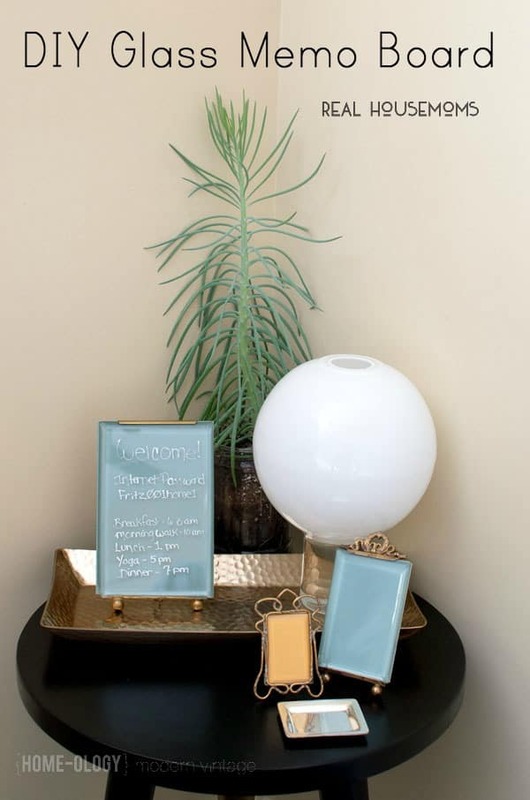 By using the glass insert as a writing surface, they serve a great new purpose and are as pretty as they are practical.